Copyright © 1944 by Grosset & Dunlap, Inc. Copyright © renewed 2006 by Harriet Schulman Forman Springer Publishing Company, Inc.
All rights reserved. No part of this publication may be reproduced stored in a retrieval system, or transmitted in any form or by any means, electronic, mechanical, photocopying, recording, or otherwise, without the prior permission of Springer Publishing Company, Inc.
Production Editor: Print Matters, Inc.
Cover design by Takeout Graphics, Inc.
Cherry Ames, senior nurse / by Helen Wells. p. cm. 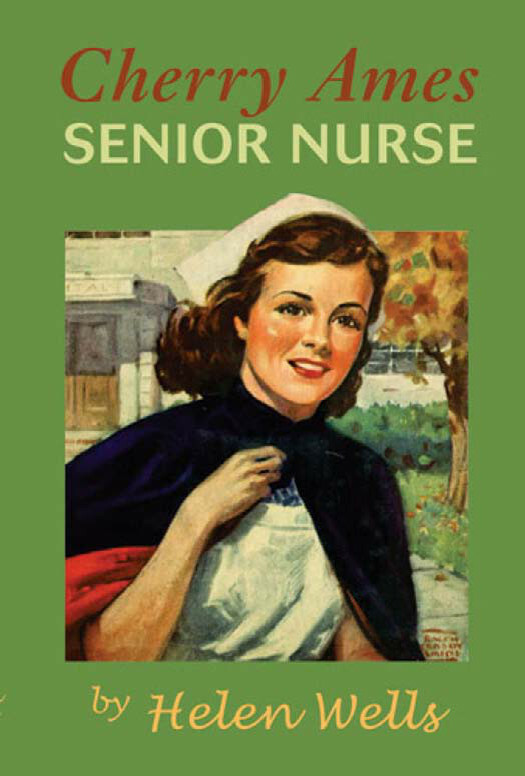 — (Cherry Ames nurse stories) Summary: During their final year of training, Cherry Ames and her friends at Spencer Hospital face difficult decisions about their futures as nurses during wartime. [1. Nurses—Fiction. 2. Hospitals—Fiction. 3. World War, 1939–1945—Fiction.] I. Title. Senior Year . . . . . . . . . . . . . . . . . . . . . . . . .
Dreams and Plans . . . . . . . . . . . . . . . . . . . Very Small Fry . . . . . . . . . . . . . . . . . . . . . .
Midge Makes Mischief . . . . . . . . . . . . . . .
An Orchid or Gardenias . . . . . . . . . . . . . . Double Trouble . . . . . . . . . . . . . . . . . . . . .
Black Lace . . . . . . . . . . . . . . . . . . . . . . . . .
Operating Room . . . . . . . . . . . . . . . . . . . . . Mom Talks . . . . . . . . . . . . . . . . . . . . . . . . .
Lex Is Proven . . . . . . . . . . . . . . . . . . . . . . .
Day of Glory . . . . . . . . . . . . . . . . . . . . . . .
Cherry Decides . . . . . . . . . . . . . . . . . . . . .
as well. Cherry Ames motivated young people on into the 1970s, when the series ended. Readers who remember reading these books in the past will enjoy rereading them now—whether or not they chose nursing as a career—and perhaps sharing them with others. My career has been a rich and satisfying one, during which I have delivered babies, saved lives, and cared for people in hospitals and in their homes. I have worked at the bedside and served as an administrator. I have published journals, written articles, taught students, consulted, and given expert testimony. Never once did I regret my decision to enter nursing. “Why not bring Cherry back to motivate a whole new generation of young people? Why not ask Mr. Wells for the copyright to Cherry Ames?” Mr. Wells agreed, and the republished series is dedicated both to Helen Wells, the original author, and to her brother Robert Wells who transferred the rights to me. I am proud to ensure the continuation of Cherry Ames into the twenty-first century. Harriet Schulman Forman, RN, Ed.D. the rising bell clanged. cherry carefully wrapped the covers around her ears, turned over and went back to sleep. late! Half-asleep, she dashed automatically for the maple chest of drawers and collided with a chair instead. Then Cherry remembered. Of course—this wasn’t her old room—this was her new room in Crowley, the residence for seniors and graduate nurses! Starting this morning she was a senior—and she was late! Cherry scrambled into her clothes as the clock ticked loudly and warningly. She ran to the closet and pulled out a crisp blue and white striped uniform, with black chevrons on the shoulder. Late or not, Cherry stopped for breath and a moment’s gloating over those senior chevrons. Then she dashed over to the mirror and slammed her nurse’s cap on her head. A breathless girl of twenty looked back at her—a slim, lovely girl with black eyes and black curls, and cheeks and lips so red they had earned her her name. She struggled to get her apron tied, but the bow balked. Outside in the corridor, instead of the usual bedlam of nurses, there was a profound silence—they all had left for breakfast long ago! “It’s still me,” Cherry marveled at her reflection. assigned there too, probably already was on the ward. “Q.E.D. no breakfast,” Cherry thought, and started off at a sprint. It was a sunny, bright blue morning, already hot at seven o’clock. Cherry hurried down the flagstone path past the many white hospital buildings, calling good morning to brisk passing nurses and internes. This was her world, she had earned a place in it, and she loved it. That is, it was her world provided she could survive her senior year. Cherry knew that this morning she was embarking on the hardest of all her three years nurses training, and was facing the severest tests so far. She tried to think some serious thoughts about it. But all she could think of was the gnawing in her stomach. She told herself sternly, as she rounded the corner to the Pediatrics Clinic, that the gnawing came from hunger and not from nervousness. She was not scared about a new and very difficult type of ward duty—Children’s Ward—certainly not! Cherry ran up the steps of the Children’s Clinic with her full blue and white skirt swirling around her, her crisp white apron crackling, and one hand anchoring her pert white cap. Puffing, she got into the ground floor just in time to see the elevator disappear upwards. noisy with clinic patients. Small boys and girls who had managed to get themselves banged up, battered, scratched, out of joint, or were on their way to being sick, would be treated here and sent home, with instructions and medication, and perhaps with orders to come back. Next door in the Babies’ Clinic, there would be expectant mothers, wisely being checked up periodically, and eagerly attending the Prenatal class in how to make hygienic preparations at home for the babies who were on their way. she ever got there. Where was that elevator? She looked anxiously up the shaft. Finally the car slid down, and Cherry squeezed in. Most of the car was taken up by a large steam wagon full of breakfast for the patients. Cherry’s mouth watered. The wagon was in charge of a small stooped woman wearing a maid’s black dress and white apron. Her old eyes, in their network of wrinkles, were bright and friendly as a robin’s. The elevator operator disappeared for the morning newspapers. , for Lucy is the children’s friend. And it will be a great happiness to have you on my ward.” As Cherry’s eyes widened, she added, “There’s not much going on on her own ward that Lucy does not know!” She lowered her voice mysteriously. “I’ll bet you’ll never guess what I’ve got in this-here old wagon for the children. “I have got one straggly geranium. But look at this!” Lucy raised the lid of an unheated compartment and lifted out a wriggling white rabbit. “Wait till the young ones see that!” The elevator man was returning, so she hastily stuffed the bunny back in the wagon. could not do it. She knew she was not even going to tell her side-kick Ann Evans about it, for Ann was conscientious enough to shoo Lucy and her rabbit away. “I’m a senior now, I mustn’t indulge in monkey business,” Cherry thought. But visions of the rabbit leading the doctors and nurses a merry chase convulsed her as she entered the new ward.